Rodeo bullfighter Wyatt Darrington's got it all figured out. The perfect car, the perfect job, the perfect looks-the perfect lie. He may be on the fast track to the Hall of Fame, but he knows he'll always be an outsider to people like Melanie Brookman. Texas-born and bred, with the arena in her blood, Melanie's come to see Wyatt as her personal enemy, and that suits him just fine-this way, she'll never realize the truth. He's been crazy in love with her for years. Melanie's always been a fighter. Fiercely independent and tough as nails, she's stood up to everything that got in her way-including Wyatt. But now her infamous temper's got her on the ropes, and there's nowhere left to run but toward the man she swore she'd never trust...and this time, there's no denying just how hot he makes her burn. This is the fourth book in the series – and I have to admit the first that I have read. I did not feel the lack of the previous books, but I am also sure that I would have understood some of the other relationships better if I had. I may also have known Wyatt and Melanie's natures sooner. I have added them to my to-be-read pile, so that I can catch up. The suspense or twist in this book is all based around one event, which has lasting ramifications. It is a while until we find out what it is, and also why it is such a big issue. I love how Mel reacts and how she rationalises everything. As we get to know more about Mel and Wyatt, we can see how suited to each other they could be. As they allow themselves to enjoy each other physically, but continue to hold back on their feelings, it is incredibly frustrating – but Ms. Dell ensures we know just how they both really feel! There are some great insights into the world of rodeo, and unusually from a female competitor's viewpoint at times. The school and training regime are also a good at bringing the world that these two live in to explain what is important to them. And the bordello bar is an inspired way of getting the two of them to spend more time together. I will definitely be looking out for more in this series. Kari Lynn Dell is a native of north central Montana, a third generation ranch-raised cowgirl, horse trainer and rodeo competitor, most recently the 2013 Canadian Senior Pro Rodeo Association Breakaway Roping Champion. She attended her first rodeo at two weeks old and has existed in a state of horse-induced poverty ever since. She currently resides on the family ranch on the Blackfeet Reservation, loitering in her parents’ bunkhouse along with her husband, son and Max the Cowdog, with a tipi on the front step, a view of Glacier National Park from her writing desk and Canada within spitting distance. Her debut novel, The Long Ride Home, was published in 2015. She is also a humor columnist for several regional newspapers and a national agricultural publication. You can find the latest information about Kari Lynn’s books, newsletter and other writing projects on her website. 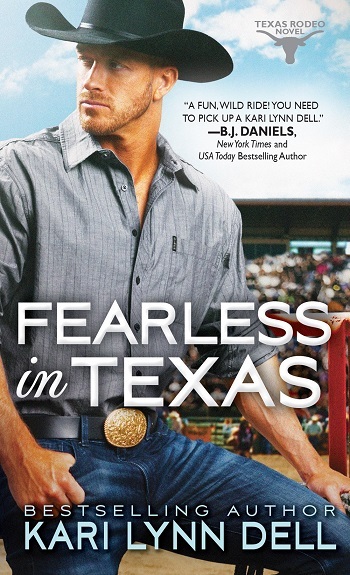 Reviewers on the Wicked Reads Review Team were provided a free copy of Fearless in Texas (Texas Rodeo #4) by Kari Lynn Dell to read and review.